A modern form of blues dance based on the dances done in juke joints across America at the turn of the last century. A modern style of blues dance based on the ballroom dance happening at the Savoy Ballroom in the '40s and '50s. Please note: This is an NTSC DVD, but it is not region-coded, so it will play on most PCs and modern DVD players without problems. 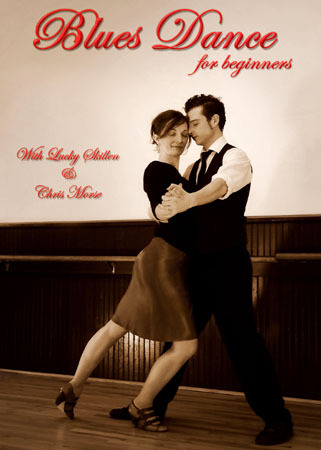 This instructional DVD is great for beginners wanting to learn the basics of blues dancing. It will leave you feeling comfortable and confident enough to hit the dance floor. Through the magic power of his huge smile, Lucky Skillen brings dancing joy wherever he goes. Lucky started dancing in 1996 and began teaching in 1998. Since then he has taught and performed a wide variety of dances in Asia, Europe and North America. He has also had the privilege of working with such celebrities as Neil Young, Kevin Bacon, Kyra Sedgwick, Katie Holmes and Frankie Manning. Lucky teaches a wide variety of dance classes in which he creates a fun and playful atmosphere. He believes that playing is learning and learning is fun! Chris Morse began dancing in 2000 in Chicago, where blues and slow, groovy lindy have strong roots. Chicago's scene, with an infinite supply of live blues and jazz music, talented instructors and fantastic friends, is where she began her dancing obsession. Chris now has thousands of hours of dance experience as well as placements in national blues competitions. Currently she resides in Denver with her musician husband and continues to explore blues dancing. She hopes this DVD inspires you to seek out your own style and find a passion for blues dancing, music and culture.